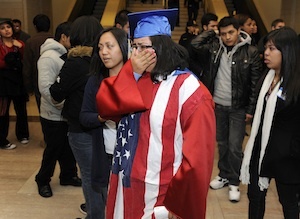 The Dream Act died in the Senate in December and with it hopes of federal immigration reform anytime soon. Yet the political muscle of Latino-Americans is poised for steady growth. Demographics have seen to that. Nationwide, the number of Latino voters has grown markedly. Of the 20.9 million Latinos eligible to vote in 2009, six million had become eligible since 2000, primarily because they turned 18. The authors of The 2010 Congressional Reapportionment and Latinos, just published by the Pew Hispanic Center, describe coming waves of a “U.S.-born Latino youth bulge.” Much of it will take place in states that have gained or soon will gain Congressional seats and Electoral College votes. Precisely how that growth will produce political influence, however, depends on reapportionment—the once-a-decade process of redrawing Congressional districts in the states according to the most recent census figures, in this case the U.S. Census of 2010. Some states have lost representatives, others have gained. It is politically significant that Latinos make up more than 15 percent of the electorate in all the states that gained seats. The percentage of Latinos is much higher in Florida and Nevada, two crucial swing states, and in Texas, which gained four seats. How will Congressional districts be drawn to even out the population of each? Will areas dense with Latinos be gerrymandered to dilute their influence? Or will Latino growth areas become new districts, as envisioned by law, able to field candidates of their own? Latinos should carefully monitor the redistricting process and express their concerns because the ramifications of redistricting last a decade or longer. Surely representation in government is too precious a right to be taken for granted, especially now. The story of Ted Williams, a golden-voiced homeless man from Columbus, Ohio, has captured the imagination and compassion of the nation. Discovered panhandling by the side of the road by a reporter for The Columbus Dispatch, Mr. Williams became an overnight sensation after he demonstrated his unique vocal talents in a video on YouTube and had the chance to tell his story of youthful hopes thwarted. His history includes years of alcohol and drug abuse and several arrests. An appearance on the Today Show quickly followed, and now warm-hearted counsel and job offers from all sides are overwhelming a man who has struggled with his demons for years on the streets. It is admirable that Americans rush to respond to an individual’s need when they know his story. It is too bad that the millions of other hard-luck tales—of missed opportunities, fractured childhoods, substance abuse and mental illness—that tell the individual stories of the nation’s poor and suffering people cannot likewise be uploaded to YouTube. Maybe if we knew the stories of more hurting people—even those who are not as talented as Mr. Williams—we would not dismiss our responsibility to them so easily. Maybe we would not allow cultural fabrications and caricatures to excuse our indifference to the needy, the drug-addicted, the undocumented migrant. Here’s to more stories on YouTube that offer accurate and sympathetic depictions of the individual humanity of suffering people among us. May these digital vignettes reveal the true faces and stories of the nation’s poor and migrant people and prod us toward a more humane and reasonable discussion of personal and communal responsibility in the future. For nervous types (and some fundamentalists) preoccupied with the end times, as predicted (or not) in the Book of Revelation, the recent revelations that hundreds of birds had mysteriously fallen from the sky in Alabama came as worrisome news. Around the same time, fish began to die in a nearby lake in inexplicably large numbers—100,000 by some counts. The most logical explanation for the dropping birds was that they had been severely disoriented by fireworks at the New Year. But that did not explain the hundreds of other dead birds in Louisiana, felled by odd blood clots, nor the estimated two million dead fish in the Chesapeake Bay nor the 100 tons of fish that washed up on a Brazilian shore. What’s going on? Will the end times be like an M. Night Shyamalan horror movie. Not so fast. Some of these odd events may be explicable (fireworks disorienting birds, collisions with electrical wires and the like). Or it may be the classic case of overreporting. As soon as an unusual event is spotted by the media, similar events that would otherwise have been seen as local affairs are also reported, lending credence to the idea of a global phenomenon. This is magnified by the Internet, where events that in the past would not have been connected are now linked within seconds. But it is important to remember that while Jesus said the Father knows when even a sparrow falls to the ground, he also said that we can predict neither the day nor the hour of the end. Remember that the next time you turn on the news or fire up your PC. About the Apocaplyse. or the "end times" I am not a Bible thumping fundamentalist, nor am I nervously fixated on what Faith assures me will happen, the event called the "Second Coming." But I am interested in the topic and have come up with the following thoughts, which may simply be the idle dabblings of someone who knows a little about many things, but not very much about anything! Yet I venture to offer the following posting. Jesus did say that not even a sparrow falls to the ground without the father knowing it, a hint no doubt at Divine Omnipresence. Also that the Man, Jesus, does not know when the end times will come, only the Father knows, a hint I guess at Divine Omniscience. But having said this, it's also true that Jesus gave clues about what will happen preliminary to the end times, or the Second Coming. A number of the "signs" appear to be cosmological, such as the sun being darkened and the moon not shining. The NT also speaks of the roaring of the sea and men fainting for fear, frightened by what is happening. The trouble is, for a non-biblical scholar like me, it's almost hopeless trying to understand what's being said, as the text intertwines the end times with the destruction of Jerusalem which happened in 60 AD when the Romans sacked and burned Jerusalem destroying the Temple. To the best of my knowledge none of the above-mentioned cosmological signs happened when Jerusalem was sacked, so I guess it's pretty safe to assume Jesus was referring to the end times. Assuming this as true, regarding the "signs" I find it extraordinarily interesting that long before it was known that the sun had a relationship to the moon in providing its light, Jesus connected the two saying that the sun would be darkened and the moon would fail to shine. But how? Could it be caused by a total eclipse of the sun caused by the shadow of of mammoth meteor hurling towards the sun and casting its shadow across the solar giant blocking its light and therefore affecting the moon's ability to shine? Jesus also speaks of star falling from the sky, meaning perhaps, that smaller meteors following the sun-blocking one will look from the earth like falling stars! Who knows? Only the Father! Finally, relative to the darkening of the sun and the shutting down of moonlight, Jesus also connected tidal disturbance to those happenings, saying that the the sea would roar, making me wonder if somekind of global tsunami may happened due to solar/luna disturbance and cause men to faint from fear! All this long before physical science understood the connection between tidal flow and the moon. Concluding, I find it also interesting that Jesus called all this cosmological disturbance, "shaking of the powers of the heavens." Will all of this result in the earthly conflagration hinted at in Scripture's dreadful words, formerly part of the Requiem Mass, "Dreaded day, that day of ire, when the world shall melt in fire, told by David's and Sybil's lyre!" Don't know, but I do recall hearing the Servant of God, Archbishop Fulton J. Sheen say on the "Catholic Hours" years and years ago, that, humanity will triger its own destruction, by undisciplined tampering with the laws of nature. Just a few thoughts on Apocalypse, intelectually and spiritually stimulating at least to me, framed in the understanding that only the Father knows for sure, not even Jesus! In regard to the gerrymandering issue in Texas, it is already too late for Latinos to pay attention to the process. If they had been concerned about this, they should have been concerned about the recent election, which produced an overwhelming Republican majority in both houses of the state legislature, despite the very sizable number of Latinos eligible to vote. Either they don't vote as an ethnic bloc, or they don't vote, or they don't care about the gerrymandering issue. This article also appeared in print, under the headline "Current Comment," in the January 24, 2011 issue.